distribution Statewide, but as with so many other "statewide"species, it has not been recorded from all mountain counties, though presumably occurring in all 100.
abundance Common to locally abundant essentially statewide, but slightly less numerous (but still common) in the mountains. There are several one-day counts of 200 or more individuals. flight Downstate, the flight occurs from early May to late October; in the mountains, from late May to mid-September. habitat Ponds, small lakes, marshes, and pools are used for breeding. Slow-moving portions of rivers or creeks may be used on occasions. behavior This is an active and conspicuous dragonfly, despite being one of the smallest species. Adults often perch conspicuously on the tips of twigs and grasses, close to water. 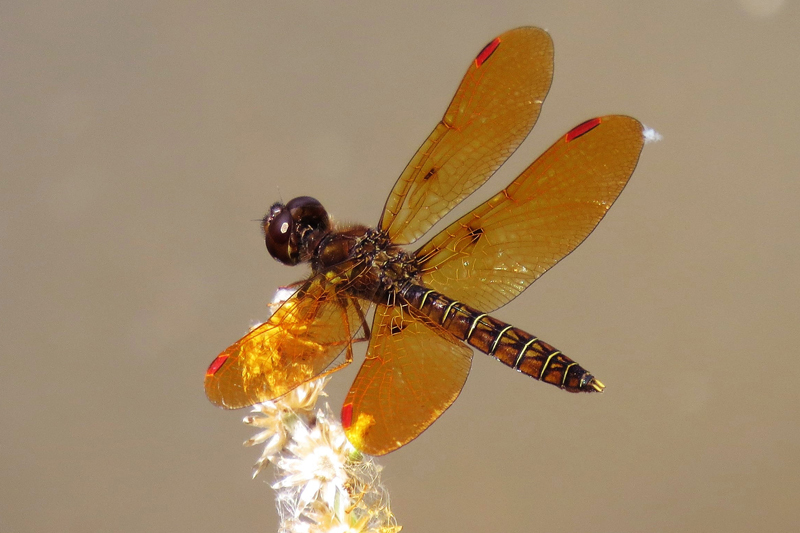 Adults will forage long distances from water, and they are among the most "urban" of dragonflies, often found in gardens, arboretums, and other places in cities where suitable prey items might occur. comments This species is a wasp mimic, with its highly colored wing patches and veins. Adults often obelisk. Females are somewhat similar in coloration to the Halloween Pennant, but the latter species is much larger in size. One would think that a dragonfly whose average length is less than 1" would be difficult to observe and easy to overlook (such as with the Elfin Skimmer), but the Eastern Amberwing is a "unique" species in NC -- there are other amberwings elsewhere -- that seems to want to draw attention to itself, often looking like a butterfly or wasp rather than a dragonfly (at a quick glance).